50% Off Selected Flying Experiences at Virgin Experience Days Looking to tick something off the bucket list? Head over to Virgin Experience Days for thrilling days out and up to 50% off now! Up to 40% Off Short Breaks at Virgin Experience Days Whether its beachside, countryside or glamping, Virgin Experience Days have the perfect short break or weekend getaway for you and up to 40% off. 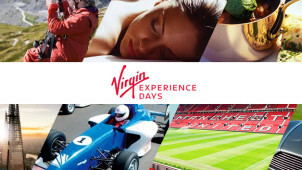 50% Off Selected Sports Experiences at Virgin Experience Days Shop the memorable experiences today and get up to 50% off selected sports including Golfing experiences, horse racing and clay shooting. Up to 50% Off Selected Gift Experiences for Her at Virgin Experience Days If you're in need of a gift she'll remember forever then head to Virgin Experience Days for amazing gift ideas she'll love. New In Experiences from £20 at Virgin Experience Days-Pottery, Brewery Tours & Photography Courses Discover super fun experiences from haunted tours for 2, to cheese making and silver smith workshops you'll be sure to find the perfect gift to yourself or a loved one. £90 Off Selected Couples' Experiences at Virgin Experience Days Find £90 off couples' experiences at Virgin Experience Days. The perfect gift for your favourite couple, or a fabulous wedding surprise! Gift Cards from £25 at Virgin Experience Days Treat someone to a special gift from Virgin Experience Days where they can choose their perfect day! 55% Off Spa Breaks and Pamper Days at Virgin Experience Days Birthday present? Just a treat for you? Whatever the reason, spoil someone or yourself with a day of relaxation and pampering. Save up to 55% at Virgin Experience Days. Free Exchanges on Vouchers at Virgin Experience Days Changed your mind about your booking? At Virgin Experience Days, you can exchange it for free! £25 Off Selected Adventure Days at Virgin Experience Days Shop the many exciting days out up to £25 off, including segway rides, bungee jumps and much more! There's no better time to give the gift of experiences. With Virgin Experience Days, you can save on adventure, discovery and relaxation across the country! When you give an experience gift, you’re offering memories too - a veritable ready-made package of excitement, intrigue and indulgence. Whether you give away a day on the race track, an afternoon of food tasting, an hour of spa bliss, or a weekend away in London - it’ll always be one to remember! Experience gifts make the perfect present for birthdays, anniversaries and Christmas! They’re also the ideal gift choice when you want to say ‘well done’, ‘thank you’ and ‘we’ll miss you’. Why not choose an experience day for a new graduate, a hardworking colleague, or a pair of newlyweds? Explore the range of experiences for memorable occasions, or begin your search by selecting an event from the ‘Occasion’ tab on the homepage. How do I use my Virgin Experience Days discount code? Your order total will drop straight away, click 'Checkout' to continue and complete the transaction. If you’re buying an experience for yourself, or will be expected to take your giftee to the experience location on the day, choose a gift which can be redeemed somewhere close by- so you spend less money on travel. Use the location search tool, or filter experiences in a specific category to only show those in your area of the country. How will my experience day be delivered? You can choose to send an experience voucher from Virgin Experience Days via email, or as a package in the post. You can also choose to have the experience gift package sent to your address, or directly to your lucky receiver! Does Virgin Experience Days offer exchanges? It is possible to exchange your voucher for a different experience, or to return your gift for a full refund. Requests for refunds are accepted up to 14 days after receipt of the gift. Returns can only be made when the gift voucher has not been used to book an experience. Find out more about returning experience gifts on the FAQs pages. Does Virgin Experience Days offer student discount? This isn't currently available, however you can check the Special Offers' page to find great deals 24/7. From afternoon tea to a comedy night - you're sure to save on a whale of a time. Virgin Experience Days is your one-stop shop for giving the greatest gifts out there. Treat your loved one on your anniversary or do something exciting with your friends – no matter what the occasion, or how difficult your family member or friend is to buy for - with a Virgin Experience Days discount code you’ll be able to find a budget-friendly solution that is bound to bring a smile to everyone’s face. Choose from a wide range of activities and events, from driving experiences with Ferrari to a 3-course meal in a fancy hotel - all dreams can be met here with Virgin Experience Days. If you’re not quite sure which experience to gift someone then you can opt for the Collection Vouchers option and leave it up to them! From a modest Amber Collection to a more decadent Platinum Collection - whatever your budget, you'll be sure to find one to fit the bill with Virgin Experience Days. You can put every person's anniversary plans to shame when you choose something from Virgin Experience Days! If you're looking for a spa day for two, a romantic yet thrilling hot air balloon ride or another extravagent activity, using a Virgin Experience Days voucher code will cut the cost of unforgettable experiences. With perfect gifts for him and her, you can even browse by price range to ensure that you stick to budget while you treat your loved one like they deserve.